The medical staff is a select group. In order to protect human health; they work hard all day, making rounds around the ward, talking with patients, performing surgery, consultation, meetings, checking the newest works of literature, writing essays, doing research, teaching, academic exchanges, and many others. Due to all of the many things they must do; they have become known as the office "busybodies," and this remains true, even for the second generation of doctors. Recently, data obtained from more than 8,000 doctors indicated that 66% of doctors work 12 hours a day, and 92% of doctors feel tired, even after resting outside of work. Due to the glamorization of the work that these doctors do on a daily basis, there is an immense pressure from the people to perform at 100% every day. When they return home, they feel so tired they just want to sit down on their couches and do nothing. Anyi Wang said that life's meaning is just gathering a collection of memories. It is a compilation of things that exist, but they are all in the mind. The feelings gained from the loss and companionship during childhood is something money cannot buy. A child only has one opportunity to grow, and if he misses it, he misses it. To bestow and compile these memories is the best gift for a child. Children are versatile and clever; a child could finish a beautiful painting today, write a happy poem, or even write prose. However, there is no compilation of such work. I suddenly had a random thought--it would be meaningful to organize the children's works into a book, and publish them as a gift for them! The title of the book would be, "Reading companion: Blooming Flowers," and everyone is welcome to propose their valuable revisions. Think about what a child has done today, and take a note of them. What surprises did he or she create? Whether it is poetry, prose, or a painting, the subject matter is not limited. For each piece of work, parents are asked to attach their comments on the children's work. It is a beautiful process of companionship to prepare the work and to contribute it. Let the reading companion start from this moment. Parent's name and the child's name will appear together in the book's editorial list. In the end, this compilation will be a memorable and cherished work! 4. Types of works: poetry, prose, paintings, etc., the subject matter is not limited. 1. Due to privacy and security concerns, children under the age of 14 should not have any photos that show their faces and their real names. Parents should try to use a nickname or pseudonym. 2. The number of submissions is not limited. Please check the specifications on the grammar to avoid profanities and typos. 3. Please use the work description or the parent's comments section to explain the background. For example, recent work conditions, weekday activities the child is enrolled in, and other events and factors that affect their growth and impact the feelings. Registration method (free): fill in the registration form, and send it as an attachment to Ms. Lucine Gao, books@amegroups.com. 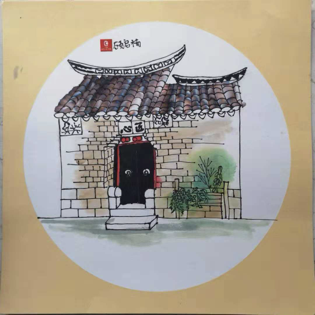 Parent's Comments: Huilongwo was built in the Qing Dynasty. It is now a historic and cultural district in Xuzhou, in the center of the city. The old building in the painting is a corner of Huilongwo. Generally, children’s life experience lacks deeper nuances to understand the historical implications of architecture, in this painting, you can still see traces of tranquillity and vicissitudes. The usage of colors in this gives the old building vitality.